Boston, MA (June 18, 2018) - Massachusetts Gov. 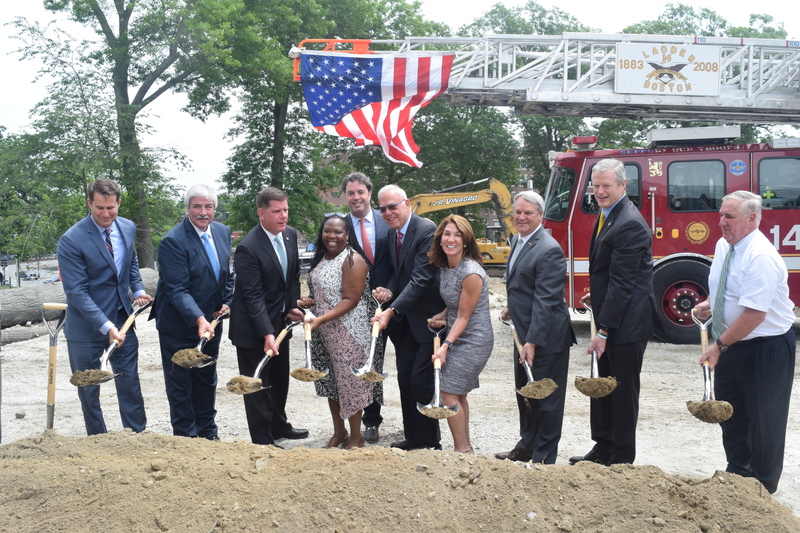 Charlie Baker, Boston Mayor Martin J. Walsh and Congressman Seth Moulton joined the veteran community today to break ground on a first-in-the-nation $46 million Boston development that will bring 102 units of housing and on-site supportive services to a variety of different veteran populations. Owned by Brighton Marine, a veteran network community, and WinnCompanies, an award-winning developer and one of the nation’s largest military housing managers, the Residences at Brighton Marine will be built on Brighton Marine’s campus along Commonwealth Avenue, providing apartments at all income ranges in a transit-oriented location for qualifying veterans and their families who want, but cannot afford, to both live and work in Boston. Construction at the 1.44-acre site is scheduled for completion by December 2019. “Our administration is proud to support this important project, which will provide new affordable housing to veterans across a range of incomes, from homeless veterans to middle-income households,” said Governor Baker. “The Residences at Brighton Marine will honor the service and sacrifice of Massachusetts veterans, by providing decent, safe, affordable homes, in a setting that will offer access to integrated health care and human services. There will be 11 studio units, 47 one-bedroom apartments, 33 two-bedroom apartments and 11 three-bedroom apartments, of which 101 units will be contained in a new, seven-story building and one unit will be developed through the adaptive reuse of a historic building that will also have ground-floor community space. "Brighton Marine is one of the city's strongest allies in our work to make sure all veterans in the City of Boston have a place to call home, as well access to health services and family support," said Mayor Walsh. "This groundbreaking marks the start of one of the biggest veterans' housing developments of its kind in Boston since the end of WWII, and I am proud that we are taking another step forward in ensuring all of Boston veterans have what they need to lead full and healthy lives." The 102 rental units will be available to veterans of various income levels, including middle income families; a one-bedroom average cost is estimated at $1,686 per month. Not only are the Residences easily accessible to public transit, but they are also near job centers, making it an optimal location for veterans who are entering the workforce. The Residences at Brighton Marine is the non-profit’s most ambitious project to date and will complement a housing initiative underway at Brighton Marine that is already helping homeless veterans and their families with an endowment fund that provides money for security deposits, first and last month’s rent, outstanding utility bills, and moving expenses. The Residences at Brighton Marine are being financed and built with substantial public support, including funds from MassHousing, the Massachusetts Department of Housing and Community Development (DHCD), and the City of Boston’s Department of Neighborhood Development. MassHousing has committed a $9.4 million permanent loan, a $14 million bridge loan and $5 million from the Agency’s Workforce Housing Initiative. DHCD has made an allocation of federal and state Low-Income Housing Tax Credits, as well as providing approximately $3.6 million in direct support, and an additional $3.7 million is being provided through the Affordable Housing Trust Fund, which MassHousing manages on behalf of DHCD. The City of Boston is providing approximately $4.1 million in financing. Bank of America is providing a $31 million construction loanand is investing more than $24-million of private tax credit equity. The development of the Residences at Brighton Marine advances the Baker-Polito Administration’s goal of creating up to 1,000 new workforce housing units affordable to middle-income households through MassHousing’s $100 million Workforce Housing Initiative. Since the inception of the initiative in 2016, MassHousing has committed or closed workforce housing financing totaling $49.7 million, to 23 projects, located in 13 cities and towns. To date, the Workforce Housing Initiative has advanced the development of 2,111 housing units across a range of incomes, including 538 workforce housing units.